MyDigitalSSD BPX M.2 NVMe 480GB SSD Review - Legit ReviewsMyDigitalSSD BPX NVMe SSD - The Best Low Price NVMe Drive? MyDigitalSSD BPX NVMe SSD – The Best Low Price NVMe Drive? Are you looking for a cost effective entry-level PVIe NVMe SSD for your system? 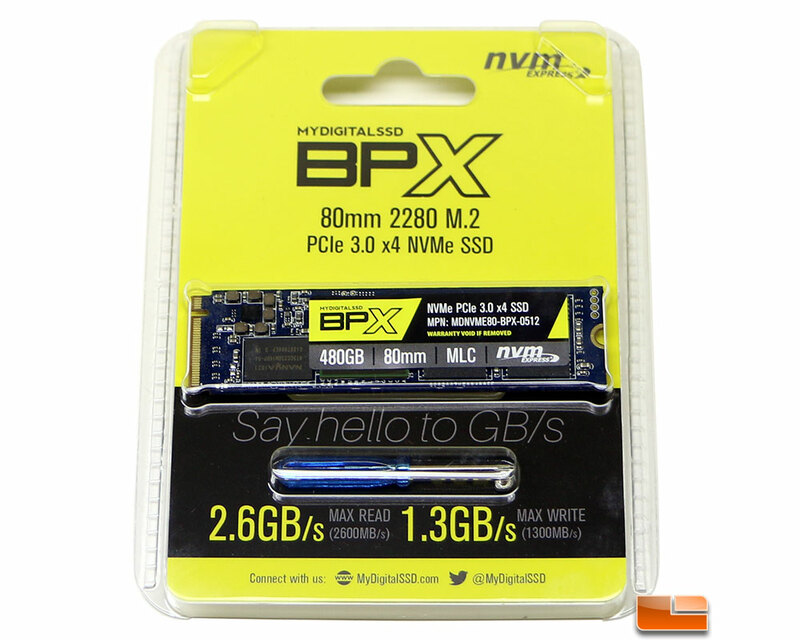 The MyDigitalSSD Bullet Proof eXpress (BPX) 80mm (2280) M.2 PCIe 3.0 x4 NVMe SSDs are shaking the market up right now due to some amazing price points. MyDigitalSSD currently offers the BPX series in three capacities; 120GB ($69.99 shipped), 240GB ($114.99 shipped), and 480GB ($199.99 shipped). Those Amazon prices put the 480GB drive around $0.42 per GB and that is the lowest priced Phison E7 controlled MLC drive that we have seen to date! MyDigitalSSD will be releasing an even larger BPX 960GB drive in February 2017. MyDigitalSSD rates their BPX series as having sequential speeds of up to 2,600 MB/s read and 1,300 MB/s write. Things are also impressive on the 4K Random Read/Write performance as the Phison 5007-E7 controller and 2D MLC NAND Flash are capable of reaching up to 150,000 IOPS for 4K Random Reads and 265,000 IOPS of 4K Random Write performance. MyDigitalSSD hasn’t just priced these drives below the competition and then given them a crap warranty. MyDigitalSSD has slapped a nice 5-year limited warranty on all the BPX drives and given them generous endurance ratings of 175 TBW on the 120GB drive, 349 TBW on the 240GB drive and 698 TBW on the 480GB drive. The drive that we’ll be reviewing is the MyDigitalSSD BPX NVMe PCIe 3.0 x4 SSD that is 480GB in capacity and sold under part number MDNVME80-BPX-00512. Next to the label on the front of the BPX 480GB drive you’ll find the Nanya 512MB low-power DDR3 DRAM cache chip then under the label is the Phison 5007 eight-channel quad-core controller and two 128GB 2D MLC NAND Flash chips. MyDigitalSSD says that they are using difference Flash than others, but would not divulge who makes the NAND. It looks like Toshiba/Sandisk 15nm 2D MLC Flash to us, but MyDigitalSSD isn’t able to confirm that. Flipping the drive over you’ll find two more 128-gigabit planar MLC NAND Flash chips and a spot for more memory, but it is not being used. The MyDitialSSD BPX series does not require NVMe drivers to work properly on a PC, but you can manually install other brands NVMe drives if you really wanted to do so. We used the default StorNVMe drivers in WIndows 10, but manually disabled the write-cache buffer. The standard Windows NVMe driver in Windows 10 and Windows 8.1 doesn’t pass the Force Unit Access (FUA) command. FUA commands bypass the DRAM cache on the SSD and write directly to the drives cache resulting in really bad performance. Storage review sites that use AS SSD, Anvil and PCMark (Storage 1.0) may show low write performance due to this. 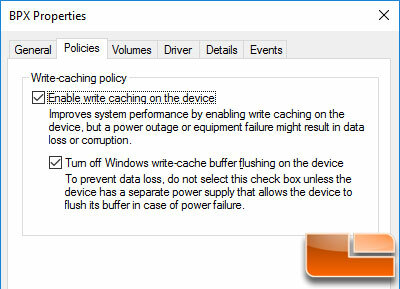 You can do registry hacks to disable FUA or simply turn off Windows write-cache buffer flushing in Windows Device Manager for the storage drive you want to benchmark. Companies like Intel, Samsung and OCZ have released special NVMe drivers for some of their NVMe drivers to remedy this situation. We’ll show you AS SSD and Anvil scores with Windows Write-Cache Buffer Flushing off. Let’s take a look at the test system and then jump into the benchmarks.